Preview Day Two: Champion on home soil, early danger for Tomokazu Harimoto in Daejeon? Winner last time out on the ITTF World Tour with his Men's Singles success in Kitakyushu, Tomokazu Harimoto will make his first international appearance since that terrific achievement on Friday 20th July as the Japanese superstar gets his Seamaster 2018 ITTF World Tour Platinum Shinhan Korea Open campaign underway in Daejeon. Everyone who follows world table tennis in some capacity is well aware of the talented Tomokazu Harimoto whether it’s because of his outstanding results against the sport’s elite stars or his iconic celebrations. However, rather interestingly the Japanese superstar has never ended up on the winning side when opposing Jeoung Youngsik, losing out to the Korea Republic player on three occasions across Men’s Doubles and Men’s Team fixtures. 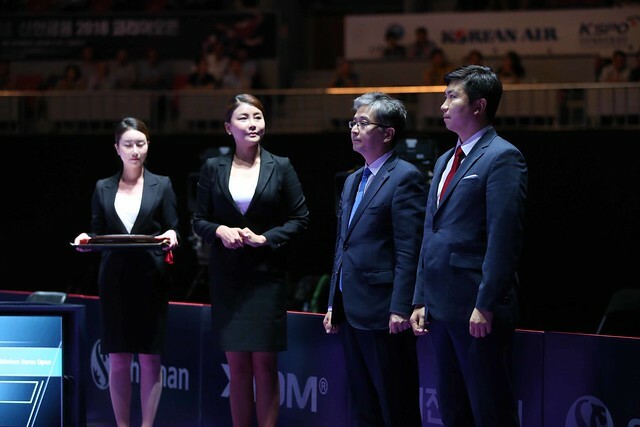 In Daejeon the two will participate in their first Men’s Singles duel on the ITTF World Tour – will this be the day which finally sees Tomokazu Harimoto get the better of Jeoung Youngsik? Simon Gauzy will open his account in Daejeon with high expectations but also with an air of caution. The Frenchman, who has been named as the No.9 seed, will take on Cho Seungmin, a player he has yet to suffer defeat against but Gauzy will be fully aware of the potential damage that his opponent from Korea Republic can cause if given the opportunity. Round of 16 fixtures are scheduled to take place in the evening session of play including the exciting prospect of Dimitrij Ovtcharov facing Jun Mizutani, with the duo set to meet for the first time on the ITTF World Tour since 2016. There’s a huge clash being lined-up in the last 16 of the Women’s Singles draw with top seed Chen Meng preparing to do battle with World and Olympic Champion Ding Ning. In their most recent head-to-head encounter in Doha it was Chen Meng who took the plaudits across five games but will we see a different outcome in Daejeon? Another fascinating tie to look forward to sees Japan’s Kasumi Ishikawa and China’s Sun Yingsha fight it out in their first meeting on the World Tour: seeded seven positions higher than her opponent Kasumi Ishikawa heads into the match as the slight favourite to reach the quarter-finals but rule out Sun Yingsha at your peril. All three doubles events will also feature on day two with quarter-finals and semi-finals matches scheduled to be played out. Watch the action unfold live from Daejeon with itTV.